Discussion in 'Reef Chemistry' started by Vincerama2, Feb 12, 2019. My apologies for this photo bing "Proudly hosted by photbucket" right in the middle of the part I wanted to show (the color of the test). 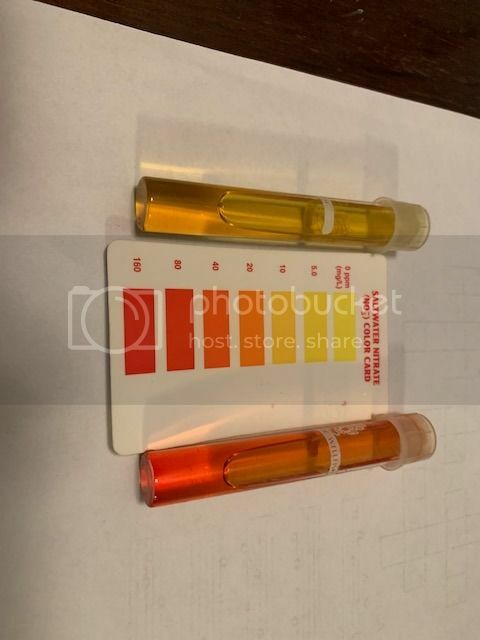 This test shows the nitrate level for the effluent of the sulphur (or "sulfur") reactor (yellowish - around 20-10 ppm) and the tank water, which is (Who can say, except that it's not yellow). This will take a LOOOOONG time, but at least it's something. Considering I started at over 200 ppm for the display tank, this seems promising. Also, I tossed a chunk of chaeto into the sump and started lighting my sump again, so let's hope all this stuff helps. PS. Who's brilliant idea was it to provide small round testtube that reflect and refract light in every direction and are impossible to compare with the "color chart". How fast is water going through the reactor? Mike, currently, I'm just looking for "not red" on my nitrate tests! The water is DRIPPING though, like at between 1 and 2 drops per second. Now, at .05 ml per drop, that is about 76000 drops per gallon (Well, 75708.2 according to math). So that means one gallon every 76000 gpd /2 dps = 38,000 seconds per gallon or 10.6 hours per gallon. But the gallons are not "unique" ie I'm not transferring from one tank to another so that each gallon is processed, but it's water from the tank back to the tank so a single drop might have already been processed. So at 180g DT and 25ish g Sump, but partly rocks, etc...let's call it about 160 gallons of actual water. That is 1688 hours or 70 days, or 10 weeks to push all the water through the reactor, but again, it's not unique/distinct gallons. Plus as it's doing this, I'm feed fish and they are pooping. Apparently, if I start smelling sulphur, it means that the bacteria colony is not getting enough nitrate and is consuming sulphur (or whatever) and that indicates that the drip rate should be increased. In terms of empirical results though, I've not seen the tank nitrate tests come in at below 100 before so this is actually pretty exciting. The lump of chaeto I've tossed into the sump should help too. It'd be interesting to see how much your nitrate rises versus how much it pulls out. Almost sounds like water changes would be more effective. You can increase the effluent. Educate me. Why this instead many of the other reactors or methods? I think he has tried other methods. This is one more option that has worked for other people, I'm one of those people. As Erin has expressed, the solution to pollution is, well, water changes and constant water changes. Finding the source might be the sole key to solve the problem. Running the fridge, TV, MW oven and halides (no to mention a toaster oven occasionally) caused the fuse/s to blow or if not so lucky, the breaker at the meter room which was pad-locked back then. Initially I bought a Midwest Sulfur Denitrifier (later sokd it to Ed /DrDoolittle) but more equipment meant mire load on the already loaded fuses and would blow or trip often if we were to use an extra small appliance. I just filled a small TLF reactor and had a "passive" sulfur-based denitrifier, running it off of the T'd drain or return (can't recall that) It did a good job and a plus was due to the acidic chamber mixed with ARM, Calcium was added as it was dissolving as well. A HUGE con was when it clogged; bad smelli filled my place in couple ocassions; I made sure my family wasn't home so I could unclog the reactor. Just sharing my experience with this type of method to deal with high nitrates. I did try the nitrate sponge media, the liquidy miracle stuff, powerhead behind the rocks to deal with dead spots so food/waste would not accumulate. I wasn't going to re-do the rock work to achieve more flow... The fuge wasn't cutting it; macro grew fine, chaeto and caulerpa prolifera? were happy. I had no space for a RDSB and thought it was very stupid to run basically a very long coiled hose inside a cylinder which is a basic concept of some de-nitrifier units. Guess I just hit the nail dead center with the sulfur unit. Where is it coming from? Large fish that eat and poop. Who knows, maybe Aiptaias poop pure nitrates? 1) Feed less. I feed two tablespoons of food (flake, pellets or "crisps) to the fish. I'm not actually willing to starve my livestock, but feel I'm feeding them a minimal amount. 2) Two MarinePure large blocks, one in the sump, one in the back of the display tank behind rocks. Not sure it does anything. 3) Added more sand to make semi-deep-sand-bed. 4) Added chaeto, but had shut off refugium light a year ago, installed new light, added fresh chaeto (this is as of last weekend) The original chaeto never seemed to grow. 5) Biopellet reactor. Wow, what a mess. The stupid balls would escape and jam up pumps. 6) Bigger skimmer. This worked well until bio-pellets jammed up the DC pump and caused it to stop working forever. Went back to my old skimmer. Replacement AC pump for larger skimmer awaiting fitting (I no longer trust DC pumps since they are expensive and I've had two fail, one which was a return pump and caused fish death). 7) Water changes... I change out 44 gallons at a time. That's an entire bag of salt. It gets expensive, takes time, it's still done, but it has never brought nitrates down significantly for any amount of time before the nitrates just go back up again. 8) Added some seachem matrix into the old bio-pellet reactor. It might help, it might not. It costs me one extra pump running. 9) Sulphur denitrator ... appears to be having an effect, time will tell. So everything above is in effect, I was really hoping the DSB and marine pure blocks would provide "passive" biological control. Hoping the chaeto will help as well. The sulphur denitrator IS working, but I think it will take a lot of time. I don't feel I can feed the fish any less. And I'm hoping I can get the big skimmer working, but really as long as my smaller skimmer is running a bit wet and I'm cleaning out the cup, it should be able to keep up (but maybe this is a sign that it isn't). The tank is now basically a fish and anemone (including aiptasia) tank, so the nitrates were low priority until I had the water tested a long time ago and my nitrates came back at over 200ppm. So now I'm trying to get it down so I can actually grow something other than aiptatia and bubble tips in the tank. PS. Mario, thanks for the sulphur reactor tips! I'm surprised it's not more common in the hobby, but maybe the other methods just work for some. I know in my old 58g, I had a pretty deep sand bed and no nitrate issues at all. Your Aptasia are likely helping on Nitrates. Wild theory: Sulphur denitrators do more than advertised. Your math on drops is correct, so they should not be effective on large tanks. Yet they seem to be. in your sand bed and live rock. It has helped me ketep my nitrates in check. Did you try other forms (other than the biopellets) of carbon dosing? I bought cheap CVS vodka and started dosing, but the reality is that I wasn't consistent with it and knew it was not a strategy that would work for me. However, I'm going to look at a doser that another BAR member has for sale. But if the sulphur reactor works,then I'm not going to pursue dosing vodka/vinegar since ... I already own the sulphur reactor and it is in effect the same thing as dosing ... feed nitrate-consuming-bacteria of one sort or the other. I mean, step one ... catch up with the nitrates that are in the water now, step two ... catch up with removing it at the rate that it is generated. OK, I'm sold. The effluent from the reactor is now actually yellow which could mean anything from 0-20 ppm. Or more, depending on your eyesight. The tank water itself is still reddish, but possibly less than 50, which beats 200 anyday. I should add however that I did start lighting my fuge 24/7 and threw some chaeto in there. Also, I had an media reactor which was meant for curse biopellets, and I just filled it up with matrix and am runing some flow through there. Not sure this does anything but convert more poop into nitrates. However, the tank vs effluent results are definitely promising! Not sure what else Sulphur denitrators put into your tank. Your chaeto will be more effective with a dark period, 6-8hrs, than 24 hours straight. Griz, thanks, I'll put the light on a timer! Arnold, OK, thanks something to think about. Don't worry, my water will never be too clean. Still lots of crap in there, just converting the final product of the ANN cycle out. Clam is in the QT tank now, which is quite unclean. Doing a water change on it tonight. Will also start feeding reef chili to that tank for the frags and clams! I remember reading an article a few years ago in REEF magazine about nitrate chambers. They pumped water into a tank, dosed a corbon source (I think it was vodka) and let it sit (with a circulation pump) for a few hours (I want to say 8 hours) then the water was pumped out to the sump and the processes repeated endlessly. Seems like something similar to a calcium reactor, once everything is stable and dialed in, it's a great way to keep things in line but a little neglect can lead to big issues.